Balasore Alloys Ltd. is in portfolio of Subramanian P. He is one of the top investors in India. It is a metal sector company. It is part of Ispat group of companies promoted by Mittals. As per the Company website Balasore Alloys was incorporated in the year 1984 at Balasore, Odisha and at present it has two plants with total capacity of 160,000 MTPA. With multiple furnaces of different capacities, the company has the flexibility to produce different grades of Ferro Chrome as per market dynamics. This adds to the competitive advantage of the organization as a range product mix can be maintained at the same time even with lower quantity requirements. The company has captive mines in different locations in Sukinda Valley at Jajpur Road (Odisha). The mines take care of the Chrome ore requirement of the company. BAL is one of the few Ferro Alloys manufacturing companies in the country having captive mines and this is a major competitive advantage since availability of Chrome ore is very uncertain and the price is volatile. Other raw materials are sourced from both Domestic and International Markets. The products of the company enjoy international reputation. The long term graph gives you idea about tentative entry and exit points. Ideally one should entry at low points or point where the company has spend most of the time. The exit point should be near the towers. So one should always consult the long term chart before making an investment decision. The long term charts does help you decide your entry point. The company has also given handsome dividend of more than 2% at current market price. 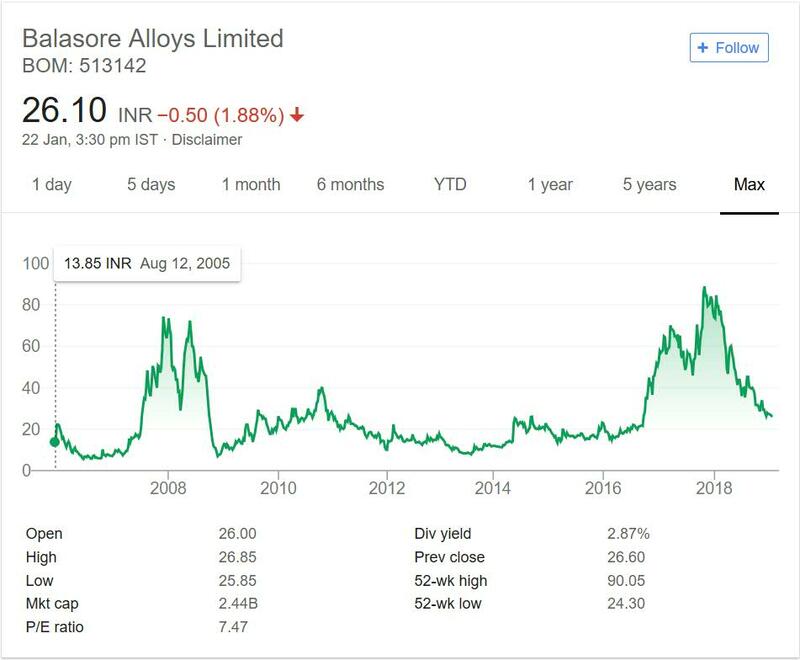 Balasore Alloys can be clubbed into Metals sector. It deals with Ferro Chromium which is used as input in Steel Industry. It is major component in Stainless Steel manufacturing. So it deals with products which is input to other industry. Steel is one of the mainstay in today’s World. The company product demands depends on condition of Steel Industry as a whole. The dependence of a Company on any one industrial vertical is not good sign. For example any slump in Steel Industry will impact Balasore Alloys as well. It has some excellent companies in list of clients for example Posco, Kores and Sail to name a few. Personally I donot like single industry dependent companies due to reasons mentioned above. Steel companies have their own share of problems as well. In case you are interested in this company then You can track the company by adding it to your stock watch list. That way you can keep close eye on the Company.